We just love Brassica oleracea, there is no way around it. For some reason though, this fall we have been really, really into cauliflower. The intensity of our new-ish obsession is fed by the vegetable's consistent presence on the counter at The Meat Market; each week a cornucopia of white, orange, lavender and romanesco cauliflowers come in from Indian Line Farm and The Berry Patch, begging us to take them home. Unfortunately for our camera, when Jake decided to bring a few heads home from the shop, all that were left were the white ones. 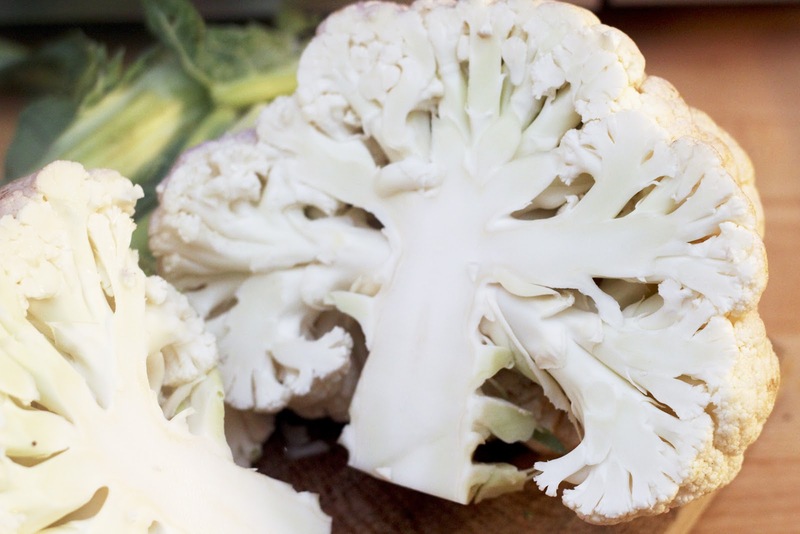 On a standard night we'd roast them alone or with a collection of fall veggies - there's nothing better than a nutty, crisp-on-the-edges bite of roasted cauliflower. But, this time we thought we should branch out a little. Looking around on Food52, one of our go-to food blogs, we came across this recipe a favorite cookbooks - Cooking By Hand by Paul Bertolli. As Paul so often does, he took amazing ingredients in their purest form, graced them with an incredibly simple preparation and created a perfect seasonal dish. Eating this soup is like eating a cloud - it is mind-blowingly light and fluffy. The delicate sweetness of the cauliflower stands out, highlighted by the earthiness of an extra virgin olive oil drizzle. And while managing to be extremely light, it still satisfied our cold weather craving for hot and hearty food. 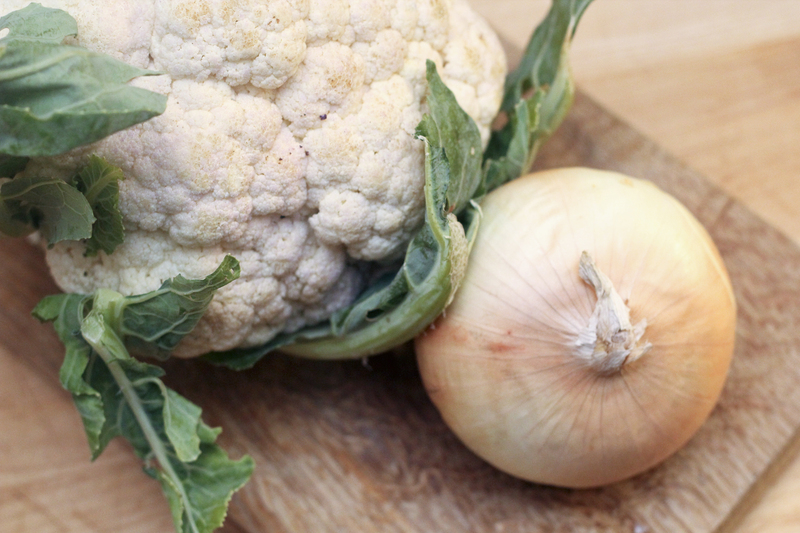 We would definitely recommend this dish with equal enthusiasm for an easy weeknight meal and a formal dinner party - it will definitely make it's way into our cauliflower rotation. 1. 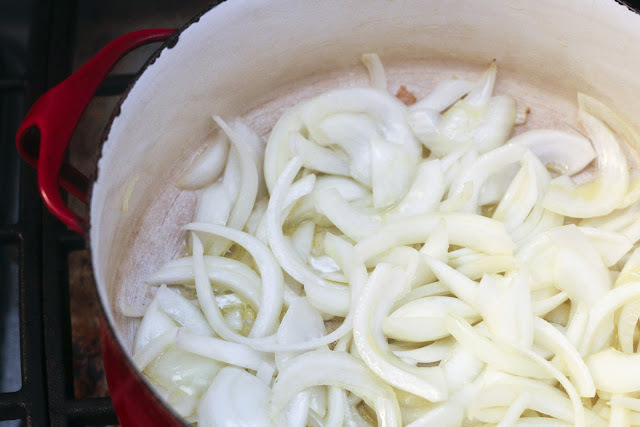 On a medium heat warm the olive oil in a heavy-bottomed pan. Put in the onion letting it brown, about 15 minutes. 2. Add the cauliflower, salt, and 1/2 cup water. Raise the heat slightly, cover the pot tightly and stew the cauliflower until tender, about 15 min. Then add another 4 1/2 cups hot water, bring to a low simmer and cook an additional 20 minutes uncovered. 3. 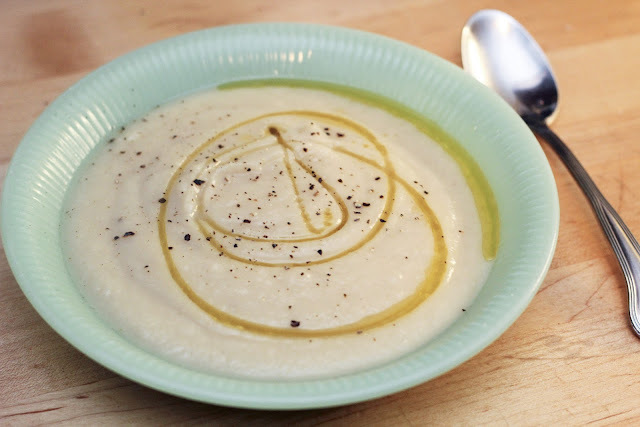 Purée the soup with an immersion blender to a very smooth, creamy consistency. Let the soup stand for 20 minutes. In this time it will thicken slightly. I cannot wait to make this soup! Being newly vegetarian I find myself pining for meat after the tri-tip post. Found you through design*sponge, and so glad I did! Thank you so much Anna, so glad you found us. We love to hear from our readers, please keep us posted as you try our recipes. I'm envious of the variety of lovely cauliflower that you have access to at the Meat Market. Here in NJ we're currently limited to foxy organic cauliflower (if organic is even available). I've got seeds for purple cauliflower, maybe this will be the year I'll be successful with it? Soup is a great idea, haven't tried that. Diana, you will just have to visit us more in the Berkshires to take advantage of our cauliflower cornucopia. Send us pictures if you make soup with your purple cauliflower. delicious! even the boys were taken with this soup tonight. with broiled drumsticks it was a perfect, simple dinner. Thanks Rebecca, that is so great to here! Keep us posted as you try more recipes. I like how you specify "very fresh cauliflower" for your recipe while your photos show age spots on your cauliflower. If it tasted good, give props to the mature cauliflower. Turned out great, such a nice winter soup.